Cootie Coo Creations: Cootie Coo Craziness Registration Now Open! 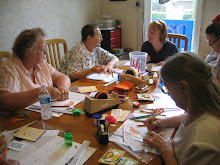 A full list of classes for October's Cootie Coo Craziness is online. You can view the classes and photos of individual projects here. Cootie Coo Craziness 2013 details can be found on the registration form. Download / Print Now!